Each week when Seacoast Peers for Careers meets I ask the participants to share a blessing for the week – something good that happened. These are especially meaningful when they occur BECAUSE of unemployment. My blessing last week was very simple: I had exact change, no more, no less. Although the air was quite cool, I had the sunroof open on my car while driving from an appointment to the weekly meeting of Seacoast Peers for Careers. It was warm and sunny enough in the car that stopping by my favorite ice cream stand seemed like a good idea. I pulled in to Dover Delite thinking about which flavor of Shain’s of Maine ice cream I was going to get – chocolate, chocolate oreo, or my latest discovery, java crunch. When I checked my wallet, however, I had two singles, one dime, and nine pennies – 21 cents short of the $2.40 needed for a kiddie cup. I looked in the pocket of my purse, the glove compartment, the token holder, all to no avail. I went back to my purse and fished around in the bottom, under the sunglasses, the tissues, and the Chapstick. What did I feel? I pulled out some change – 2 dimes and 1 penny. Golden! Once again, it’s the little things that count for so much. Last evening our doorbell rang. There was a woman asking about the house next door to us, which has been for sale since fall and has not been regularly occupied for about two years. The owner had been around a few weeks ago to move out some things; but other than that, there has been no activity. The woman has driven by the house a few times and noticed a cat in various windows and was concerned about it. My husband asked about the coloring of the cat, and it matched the one reported missing about 3.5 weeks ago by the young family that recently moved in across the street. The realtor listed on the sign lives locally, so my husband called her and explained the situation. She came down with a key. A few minutes later, our neighbor was inside trying to capture his long-missing cat who was doing all it could to hide, energy apparently not an issue. We’re assuming that the cat must have gone inside when the doors were left open during the partial move. I’m not sure I want to know what the cat has been eating and where it has been resting; but from what Bob said, while it’s a bit scraggly, it doesn’t appear to be any the worse for the experience. Two parents, four kids, two dogs, and one cat, are all home safe and sound on the Sunday night before school vacation. All is well with their world. It’s been quite a while since I have blogged. After reading today’s entry, you will understand why. While far from a “sun worshipper,” I find being in the warm sunlight so restorative to my spirit. So I was disappointed when the recent trip my husband and I took to Florida during spring break in March proved to be pretty cold and windy. While it was good to get away, not getting to spend some time just relaxing with a book while sitting outside in warm sunshine (oh, and maybe taking a nap there too), left me unable to truly pull back from the cares of my life and really relax. You see, the events of the last couple of months converged leaving me in the darkness. Anxiety had become my constant companion. I’ve been nervous each morning before I head to class and each time I have to be part of a group. My confidence is shaken and my self-esteem is low. While I have been in some new situations for sure, this is so uncharacteristic for me. Added to those feelings and exacerbating them were some medical concerns. Some meds I had started shortly before the start of the new year made my blood pressure go crazy. This, of course, created anxiety of its own. As my primary care provider worked with me to adjust meds and get my BP down, I found myself falling into a depression. I found myself at a very low point just as we came back from Florida. My birthday that next week was celebrated back at the doctor’s office where I arrived in tears. While relieved to learn that one of the meds being used to control my BP and also relieve some of my anxiety can cause depression, I realized that hitting a second birthday without full-time employment was also contributing to my downward spiral. I was not feeling sorry for myself but was unable to stop those feelings of inadequacy and failure that had surrounded me, also pulling me towards the abyss. As I write this, I am not completely out of the woods. However, my BP is under control, my newer meds don’t appear to be causing any issues, and I feel less nervous. I’m still a bit unsure as I leave the house each day, but I have not cried in a number of days. I am still very tired a good part of the time, but I am laughing more and finding joy again in those simple pleasures of a husband and family who love me and all the other blessings in my life. It’s cold and rainy in Dover again, weather so different from the first day of spring almost a month ago and the beautiful warm Easter weekend of two weeks ago. But this, too, shall pass. This is New England after all, where the weather changes regularly. It is because of that change that I so appreciate the warm sunny days when we have them. As I’ve gotten older I’ve thought about that phrase above and how it has changed over time from when I took it literally as the 4th Commandment and assumed it meant absolute obedience to anything my parents would have expected from me. Like many things, as I got older, I realized that the phrase itself is just the beginning of the depth behind it. 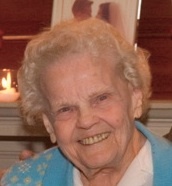 My mother-in-law, Eva, was a sweet gentle spirit with twinkling blue eyes. She loved to read and work crossword puzzles till advanced macular degeneration took away that pleasure. She substituted books on tape till her dementia made it hard for her to remember how to work the tape machine and left her confused sometimes thinking that her vision had gotten bad that morning rather than years before. She always knew, however, when I entered her room and always had a kind word for me and an inquiry about how my job search was going. I’m thinking about her this New Year’s Eve remembering that my little family of husband Bob, daughter Kim, son Kirt, and daughter-in-law Britt were with her when she left us around 3:30 PM, December 31, 2008. In pausing to reflect on the last months of her life, though others would disagree, my husband honored her when the doctors recommended that she move to a nursing home because the care she needed was more than could be given at home, her safety and well- primary concerns. It was a tough adjustment as being anywhere new was uncomfortable for her because of her sight. In the 18 months she was there, she won the hearts of the staff with her quiet demeanor, appreciation of anything anyone did for her, and her wry wit which would always catch folks off guard because she so rarely spoke. During her last month, she would repeatedly ask my husband how old she was and he would gently reply that she had recently turned 92 and her sister in Texas was 100. She would quietly respond that 92 was too old and that she didn’t want to live to be 100. She was making her wishes known to us in her own way as she confirmed that desire by eating less and less. Others encouraged my husband to arrange for a feeding tube and do whatever was necessary to keep her alive. My husband would calmly reply that this was her wish and he respected her decision — honoring his mother by understanding that this was the last thing in her life she had any control over. Christmas Eve came, and we realized that we needed to share a family tradition with Eva one last time. Of all the traditions we have for Christmas, reading The Night Before Christmas is one of the strongest. Bob’s dad had started the tradition when he was a young child with a copy that had fuzzy Santa suits and stockings just meant for rubbing. Bob continued the tradition each Christmas Eve with our kids, even now that they are adults. We shared a tradition that encompassed more than the reading of a secular story, a tradition that for us means family, love, caring, memories, and more, a way to connect our past, our present and our future and honoring all that has been. We read each page in turn, sometimes choking back our tears. And when we took her hand to rub the fuzzies, we knew that she was aware of what was happening. We were struck with all this moment meant for each of us as Bob read the final words, “Merry Christmas to all, and to all a good night.” We were given the gift of Christmas at that moment and knew that we were honoring her in a most special way. As mentioned above, she passed away a few days later and the acts of love and caring (dare I say, honoring?) continued in a variety of ways. As we were gathering our things in preparation to leave Evas’s room, I said that I was going to go home and make pasta with meat sauce, a definite comfort food for me. My daughter-in-law replied that she would take care of that and I should go home with my husband – honoring, this time a mother-in-law. No one wanted to be anyplace else than with each other that evening, so after dinner we gathered in my daughter’s apartment upstairs from ours and watched a silly movie — honoring my husband and me with their presence then and throughout the following days. My son and daughter helped me write both the obituary and the eulogy I would deliver – showing honor not only to their grandmother but me as well. There are many more examples I could site as I am sure you can too from your own stories. But I think what I have discerned from my remembering today is that honoring is simply another word for love. May 2010 be full of joy and love for you and yours. “What?” you ask. Happiness, of course. Among the people I have met during my season of unemployment have been Howie Lyhte, an incredibly intelligent man who goes out of his way to share articles, tips, hints, with the rest of us who are part of the same list serves and groups. I think he’s been unemployed longer than I have; yet every time I see him, he is completely engaged with whatever is going on and has a welcoming smile on his face. Another person I have come to know about is Dan DemaioNewton who is Director of Strategy and Business Development at Monster Worldwide. Pretty impressive job, wouldn’t you agree? Well, he has taken the time to create www.betterjobsfaster.org as a place where we work seekers can post resumes, share jobs, learn about upcoming meetings, and uplifting articles like the one that follows which I share with you on this Thanksgiving Eve. This story was sent to me by our fellow job seeker, Howie Lyhte. He was right, it did make me smile. I’m sharing it with you in the hope that it also makes you smile and encourages you to focus on that which is most important. – Dan. A 92-year-old, petite, well-poised and proud man, who is fully dressed each morning by eight o’clock, with his hair fashionably combed and shaved perfectly, even though he is legally blind, moved to a nursing home today. His wife of 70 years recently passed away, making the move necessary. After many hours of waiting patiently in the lobby of the nursing home, he smiled sweetly when told his room was ready. ‘I love it,’ he stated with the enthusiasm of an eight-year-old having just been presented with a new puppy. Mr. Jones, you haven’t seen the room; just wait. ‘That doesn’t have anything to do with it,’ he replied. Happiness is something you decide on ahead of time. ‘Whether I like my room or not doesn’t depend on how the furniture is arranged … it’s how I arrange my mind. I already decided to love it. It’s a decision I make every morning when I wake up. I have a choice; I can spend the day in bed recounting the difficulty I have with the parts of my body that no longer work, or get out of bed and be thankful for the ones that do. ‘Each day is a gift, and as long as my eyes open, I’ll focus on the new day and all the happy memories I’ve stored away. Just for this time in my life.